Earlier this month, we enjoyed our fourth multi-night rafting trip with O.A.R.S. If you do something four times, it’s because you love it, and there are very few vacations we’ve loved as much as O.A.R.S. trips. This unique family vacation combines some of our favorite things: outdoor exploration, adventure, isolation and off-the-grid family time, and conservation. And it packages all these elements into a vacation where my husband and I don’t have to worry about directions, dining, or any other major decisions. If you’ve read our previous reports from O.A.R.S. trips, which include our two times on the Rogue River, our trip on the Salmon, and our trip in the Tetons, and you still haven’t booked a river rafting trip with your family, maybe it’s because you’re not quite sure what to expect, are not quite convinced such an outdoor trip will be in your family’s comfort zone, or maybe just fear the unknown. I understand. I’m here to help, and I’m going to get really nitty-gritty with you, because knowledge is power, right? What to expect from your guides: The night before your trip begins, you’ll meet your trip leader and fellow rafting companions at a nearby hotel or resort. I’ll go into more detail about those fellow rafting companions in a bit, but first: the trip leader. This is an individual, male or female, who has the most authority during your trip. Trip leaders rotate throughout the season, so keep in mind that some of your additional guides on your trip may also have trip leadership experience and be every bit as competent. In my experience, O.A.R.S. trip leaders are ruggedly outdoorsy types between age 30-45, who have often made the outdoor recreation industry their career choice. Your trip leader will go over logistics for the launch the next day, issue your dry bags (more on that soon, too), and tell you any updates on weather, packing, or water conditions. You’ll meet your additional guides the following day, at the put-in location. Sometimes, the put-in is nearby, just a short van ride away, and sometimes, as is the case on the Salmon River in Idaho, it’s a charter plane flight away. On our trips, which ranged from as few as 10 guests total to 18 guests, we always had 3-4 additional guides. These guides are generally younger (with the exception of any guides who are also trip leaders). Some are college students, but most are in their 20s. We’ve had some great guides and some just ok guides, but never a bad guide. What to expect from your fellow guests: Well, you can expect just about anything and everything, which is one of the ‘unknown variables’ of commercial river rafting. In a small group, in a fairly intimate setting of camping together, it is frankly a big bummer to get saddled with people you don’t get along with or don’t like for whatever reason. It’s a risk, no way around that. However, while we have been on O.A.R.S. trips with guests who occasionally annoy us, we have never experienced a downright ‘bad’ guest. I believe this is because in general, the individuals and families who book multi-night river rafting trips have something essential in common: we all value the outdoors and the opportunity to explore the scenic river. If you do encounter a guest who is, shall we say, difficult, there are a few things you can do to help the situation. First, trust the guides. If a guest is difficult, they are aware of it, and are the best authority to curb any unwanted behavior. Best to allow the guides to be the ones to tell guests where to place their trash, not to hog the kayaks, or to stop diving headfirst into the water. Second, if both you and the other guests have kids, it can help to set some basic shared rules in place right away. That way, kids don’t feel frustrated when rules are different for others. Most of the time, this happens naturally, because O.A.R.S. sets the rules for rafting, swimming, use of PFDs and helmets, and even how many sodas and snacks are consumed (by kids). There’s very limited ability to be on screens on an O.A.R.S. trip, so likely, you won’t have to contend with varying electronics rules. A few times, we’ve encountered families with vastly different parenting styles from us, but all it took was a brief family meeting to remind our kids that our rules would remain in place for our kids, and that was that. What to expect from meals and drinks: Aside from group dynamics, people worry most about food on trips, don’t you think? On each of our O.A.R.S. trips, we ate better on the river than we do at home. Every meal was made from scratch with whole food ingredients, and all were cooked and prepared swiftly and efficiently by our guides. Between meals, GORP (trail mix) was available, and before each meal, ‘appetizers’ were set out, even at breakfast and lunch. For example, at breakfast, coffee came out first, along with dry cereal (usually Cheerios and granola), yogurt, and orange juice. When ‘real’ breakfast followed, it might be French toast, eggs Benedict, or pancakes. At lunch, while our guides prepared the meal, snacks were set out such as cut veggies and dip, chips, fruit, and cookies. A typical lunch would include sandwich fixings and/or a hearty salad. Before dinner, a cooler with sodas, beer, and wine was available (with a ration of approximately one soda per day for kids and 2 drinks for adults), along with appetizers such as chips and salsa, bruschetta and toast points, or veggies, followed by salmon and cous cous, steak and potatoes, or enchiladas, always followed by dessert. If you want to bring additional drinks, families are free to do so, with the general understanding that they’ll be willing to share. Guides store your additional drinks for you, keeping them cooled. 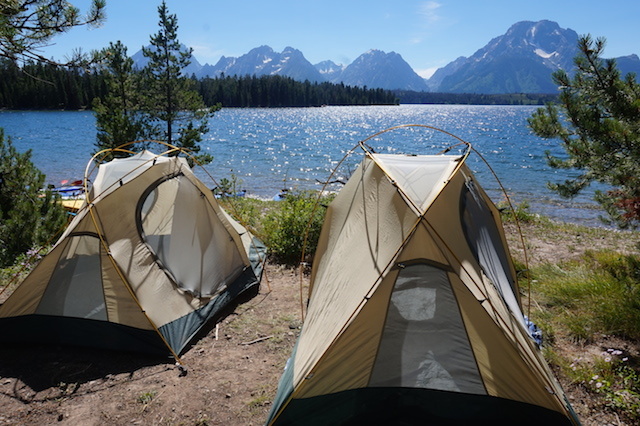 What to expect from the camping experience: On our last O.A.R.S. trip on the Rogue River, we rafted with a family who had never camped outside before, and they rocked it! You get tents from O.A.R.S., which you set up yourself after a demo, at each campsite. You can also rent a sleep kit, which includes a sleeping bag and paco pad (big thick rafting pad) and liner. Or, you can bring your own sleeping bag and pad (though if you do, I still recommend using a paco pad for comfort…you can rent this solo). Most nights on the Rogue and Salmon, we didn’t even bother sleeping in our tent, the weather was so nice. We slept under the stars, setting up a tent only for changing clothes and storing belongings. Within each campsite, it’s easy to find a little corner for your family, but you’ll want to remember that you won’t have total isolation or much privacy. Expect to still see the other tents, the guides’ sleep pads, and the camp kitchen area. I promise this is no big deal: you get to know fellow guests very quickly on an O.A.R.S. trip, and you can always set up your tent for some privacy. What to expect from the bathroom experience: Okay. Let’s get real: this is the issue people are afraid of most. How do you take care of your bathroom needs when you’re in complete wilderness, away from any plumbing whatsoever? Two ways: first, you pee in the river, as mandated by Leave No Trace (dilution is the solution to pollution). This is easy to do during the day…after all, you’re in the river most of the time. It’s harder during the evenings and mornings at camp, especially for women. Men tend to just walk a few paces downriver and stand to pee into the current from the shore…no biggie, no one even notices. Women, here’s what you do…and sorry for going here, but I’m in the outdoors a lot, and very comfortable with this stuff: if you need to pee and you’re out of the water for the day, you go behind one of the rafts, which will be ‘parked’ at the shoreline for the night. Behind their protective wall, you squat by the water, facing the camp. This ensures you moon the river, not the camp. After a few tries, I promise you’ll get good at this and no one will see a thing. When you’re getting used to this technique, it helps to wear a skirt or sarong, so you can eliminate even the mooning part. For #2, O.A.R.S. sets up what they call the Groover (so named because it used to be a simple bucket or square metal box that would leave grooves on your backside). Now, it has a toilet seat (luxury!). The guides always set up the Groover at camp, in a discreet (but rarely discreet as you’d like) location from the hub of camp activity. You’ll know where the Groover is because there will be a hand wash station (two buckets of water with a foot pump and soap)…and the Groover will be a short walk from this station, hidden as best as possible behind trees, willows, or other natural barriers. It is by no means completely private, with doors that lock, etc, and I know that’s hard to handle at first. But I promise you’ll get used to it. And the thing is, everyone is in the same boat. You’ll know you won’t be interrupted because if you have the TP, others know someone is using the Groover, and when you’re done, you bring the TP back to the hand wash station. The Groover is for solid waste only, as everything in it is packed back out (per Leave No Trace rules), so no peeing in the Groover. However, if you would rather not pee in the river, there is a pee bucket next to the Groover, for that use. I know, this is so gross, but this is the nitty-gritty part, and I bet it helps to know what to expect ahead of time. What to expect on the river: The actual river is probably what people worry least about, but I’ll cover a few things anyway. Depending on your destination, most O.A.R.S. trips include paddle rafts (where lots of people can paddle together, with a guide), oar rafts (with a guide rowing only), and IKs or duckies (inflatable kayaks), paddled by guests individually. Sometimes, there are also stand-up paddle boards. IKs and paddle boards provide the most adventurous way to experience the river, but all the methods of river transportation are fun. Guides do a good job of making sure popular boats are shared evenly, but you can help by not ‘hogging’ certain things, like IKs. Often, rafters using IKs will need to take a ‘ducky test’ or ‘ducky practice’, where they’re required to purposely flip it over, flip it back upright, and get back in, in water over their head. This is not as hard as it sounds, and most people can do it with some practice and instruction. Kids usually need to be 12 to ‘ducky’ on their own, but tandems to be shared with parents are also available. Most of the time, you paddle the river for a few hours in the morning and a few hours in the afternoon, with the remainder of the time used for lunch, short side trip hikes, and swimming time. Have additional questions about what to expect on an O.A.R.S. river rafting trip? Ask me in the comments!